DETROIT, Jan. 7, 2007 -- The 2008 Ford Focus is redesigned inside and out with a bold new exterior, a modern interior and a long list of new safety and technology features, including Ford Sync(TM) -- Ford's exclusive fully integrated, voice-activated in-car communications and entertainment system for mobile phones and digital media players. Also new is a sporty two-door Focus coupe, which is designed to attract new and younger buyers in the growing small car market. Small cars make up the largest vehicle segment in the U.S. today, and growth is expected to continue. "We're expanding our commitment to small cars, as that is where many of our customers are headed. The new Focus is substantially upgraded, and it's the start of several new small cars coming from Ford in the next several years," said Mark Fields, Ford's president of The Americas. "We've packed more style, more comfort and more features into the new Focus, but we've left the fuel economy as strong as ever." On sale in the fall of 2007, the new Focus will offer fuel economy rivaling smaller vehicles. With its fuel efficient 2.0-liter engine and approximately 60 pounds less weight, the new 2008 Focus is expected to deliver real-world fuel economy similar to today's model, despite added content and a stiffer body. Currently, Focus is among the segment's best with a U.S. EPA rating of 37 miles per gallon on the highway. In shaping the new Focus, the design team looked to the Ford Fusion, drawing on its prominent chrome-bar grille design, flared wheel arches and crisp lines to create a small car that's stylish and sporty. Several bold details bring the exterior of the new Focus to life. One is the taut character line that runs from the taillights across the doors just below the door handles and then snaps down at the front wheel well. Another example is the four separate creases incorporated into the hood. The headlights are a design story by themselves. Horizontal bars with a matte surface run through the reflection area, visually connecting the headlights with a sweeping line running through the chrome-bar grille. "We've taken cues from fashion and home design and translated them into a fresh new Focus interior," says Lon Zaback, Focus chief designer. "We've created a second home on wheels with such details as ambient lighting that is popular in homes today. We've also used higher-quality materials -- like the silver metallic finishes you see in appliances -- to make the overall package more inviting." Customers can order a new ambient lighting package that places tiny LEDs inside the front and rear cupholders and in the footwells. The LEDs can highlight the cabin in any of seven different colors through a dash-mounted switch." Overall, the interior is modern and quieter. The 2008 Focus features a new acoustic windshield, thicker side glass in the front doors and additional sound deadening materials throughout the cabin. A "top-of-dash" display -- positioned at eye-level on the center stack -- features a message center that is easier to read when driving. In addition, a new center console design replaces the traditional "brick" pattern for the radio and heating/air conditioning controls. It also houses a standard auxiliary audio input jack and two power points. To meet customer demand for must-have technologies, Ford Sync is available in the new Focus. Developed in association with Microsoft, Sync is Ford's new factory installed, voice-activated in-car communications and entertainment system for mobile phones and digital music players. Sync connects to cellular phones and downloads personal features, such as phone books and ring tones. Using Sync's voice recognition software, drivers can place and receive calls and receive text messages using the vehicle's audio system. Users can even maintain a cell phone conversation while entering or exiting the vehicle. Sync also offers hands-free, voice-activated control for nearly any digital media player, including the Apple iPod(R), Microsoft Zune(TM), "Plays for Sure" players and most USB storage devices. Even MP3 files saved on flash memory sticks can be played by simply inserting the stick into system's USB port. Because Sync is fully upgradeable, Focus owners will never need to worry about whether their car is compatible with the latest phone or music player that hits the market. 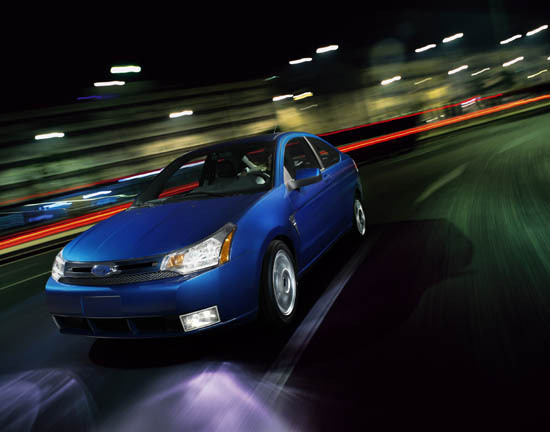 For 2008, the Focus's curb weight is reduced by 60 pounds, even though the body structure is stiffer. In retuning the body structure, engineers concentrated on such specific areas as the roof structure, package tray, rear floor area and door systems. They also added a stiffened cross-car beam under the instrument panel for even better lateral stiffness. The result is sharper steering and handling with improved ride quality at the same time. The 2008 Focus features a 2.0-liter, 16-valve, four-cylinder engine with a new air intake system and new cooling system delivering an estimated 136 hp. Available in states adopting the California emission standards is a super-clean Duratec 20E engine that qualifies as a Partial Zero Emissions Vehicle (PZEV). The 2008 Focus, in addition to Ford's Personal Safety System, comes standard with side air bags and side air curtains. The advanced side air curtains -- Ford's Safety Canopy(TM) -- feature "roll-fold" technology. If occupants are resting their heads against a window, the curtain is designed to slide between the glass and occupants as it inflates. In the event of a rollover, the curtains remain inflated for several seconds to enhance protection during an extended crash event. Ford Motor Company, a global automotive industry leader based in Dearborn, Mich., manufactures and distributes automobiles in 200 markets across six continents. With about 300,000 employees and more than 100 plants worldwide, the company's core and affiliated automotive brands include Aston Martin, Ford, Jaguar, Land Rover, Lincoln, Mazda, Mercury and Volvo. Its automotive-related services include Ford Motor Credit Company. For more information regarding Ford's products, please visit http://www.fordvehicles.com/.